The pressure to maintain a perfect figure has driven women to embrace a trend previously reserved for period dramas: the corset. The old-fashioned one-time wardrobe staple is still the simplest way to achieve a smaller waist and stomach while creating curves where they are needed. The latest brand cashing in on this season’s hourglass trend is the Oh My Corset! 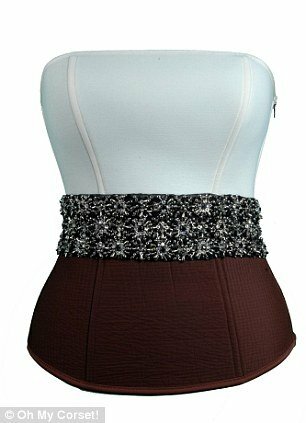 company which uses the same material used in the construction of Formula 1 cars, scuba material and even mesh that holds back avalanches on the mountains to make its super-strength corsets. No wonder it already has a host of famous fans. Oh My Corset! is an Italian brand that was born from the idea of reinventing the old corset into a modern one using high-tech fabrics. F1 seat fabric is a favorite due to its ability to stretch, breath and its malleability. The corsets, which range from $500 to $1,450 and are available in Paris and London boutiques, combine the modern fabrics with detailing and materials originating from traditional Italian couture like silk, satin, wool yarns, pearlage embroideries, crystals and glass stones. All the corsets are assembled in a factory in Piedmont, one of the only two remaining specialists working in Italy. They use old machinery, which upholds the traditional craftsmanship and helps keep this tradition alive, but the modern fabrics plus the company’s one size-fits-all approach means less labor, less travel and therefore a more sustainable product that doesn’t take months to make. The aim is to create a product that works hard and still keeps the wearer comfortable – no more breathing in required.